Are you getting every income tax credit you are due? If you are not, then you are just leaving your hard-earned money with either the state or federal government. Below is some information about many of the tax credits for which you may be eligible. Click on the links below to learn more about the credits and eligibility or visit one of the many free income tax preparers near you. The Home Heating Credit is a way the State of Michigan helps you pay some of your heating expenses if you are a qualified Michigan homeowner or renter. You may apply for a Home Heating Credit for your November 1, 2017 through October 31, 2018 primary heat source. To apply, you must meet the total household resources guidelines (see below), own or rent the home where you live (including rented apartments and mobile homes) and have your heat bill (gas, electric or heating oil) in your name. You claim the credit, you should complete the Michigan Home Heating Credit Form (MI-1040CR-7 will be available in by January, 2017). The deadline for submitting this form is September 30, 2017. If you are unsure of whether or not you qualify for the Home Heating Credit, or have any questions, contact your nearest free tax site. 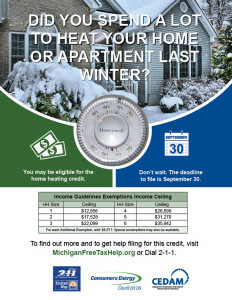 Go to the the Michigan Department of Treasury Home Heating Credit web page for more detailed information, including a Total Household Resources Checklist to help determine what kinds of income needs to be included. Michigan’s homestead property tax credit is how the State of Michigan can help you pay some of your property taxes if you are a qualified Michigan homeowner or renter and meet the requirements. You should complete the Homestead Property Tax Credit Claim form (MI-1040CR) to see if you qualify for the credit. The credit, for most people, is based on a comparison between property taxes and total household resources. Homeowners pay property taxes directly and renters pay them indirectly with their rent. Given that each taxpayer has unique circumstances that determine their eligibility for the credit, you should go to the Michigan Department of Treasury Homestead Property Tax Credit page to learn more and access the forms.